Distinguished Prof. Rahmat-Samii was the Keynote Speaker at the 2019 IEEE IWAT Conference, Miami, Florida. Distinguished Prof. Yahya Rahmat-Samii delivered the conference keynote/plenary speech titled, “High Performance Ergonomic 3Tesla MRI Neck Coil Developments: Design, Implementation and in MRI Machine Characterizations” at the 2019 IEEE IWAT (International Workshop on Antenna Technology) in Miami, Florida, March 3-5, 2019. This conference covers all aspects of advanced antenna designs in wireless and medical applications. Prof. Rahmat-Samii has pioneered many modern topics in antennas for wireless and medical applications. 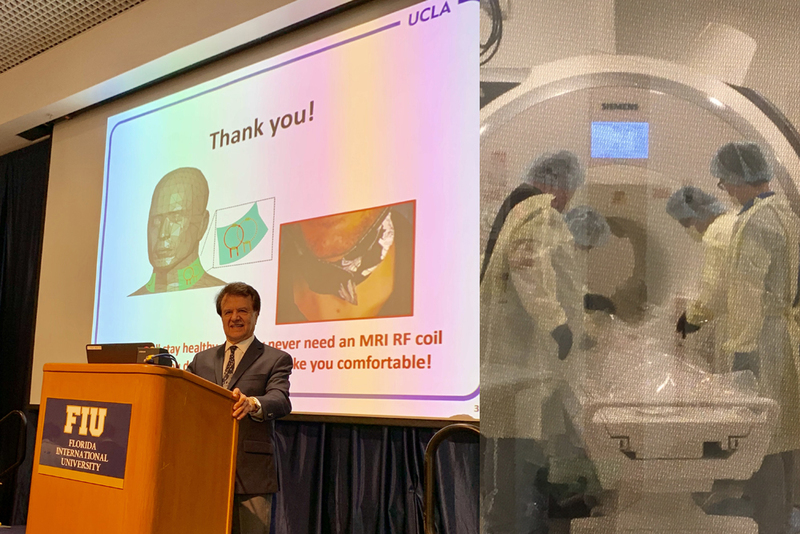 The photo shows the testing of the ergonomic coil receiver antenna using a cadaver by Prof. Rahmat-Samii’s PhD student, Daisong Zhang, under the supervision of Dr. Wu at the UCLA Medical Center.